Below is our updated information in the wake of the recent accident of leakage of contaminated water at the Fukushima Daiichi Nuclear Power Station (NPS)*, which has gotten a lot of media coverage in Singapore since this August. As we have received many inquiries from concerned Singaporeans about the safety of drinking water and food products in Japan, we hope that the information below will help readers feel assured in visiting Japan and enjoying Japanese cuisines without any fear. 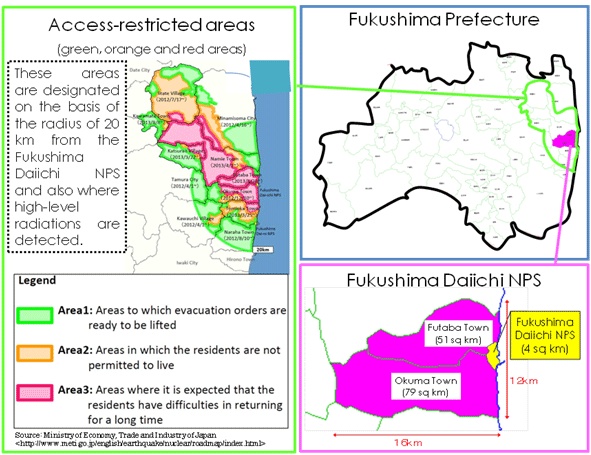 Overall, there has been no significant level of radiation measured throughout Japan since March 2011, except for the area in the close vicinity around the Fukushima Daiichi NPS, even after the accident. Up to today, the Government of Japan (GOJ) has received no report of any health damage caused by consumptions of food and drink. This is because GOJ has taken various measures since March 2011 to ensure public health of local residents as well as foreign travelers in Japan. For example, food safety is secured by (i) setting radiation limits in accordance with the international standard of Codex Alimentarius, (ii) rigorous inspections before food products are placed in market distribution, and (iii) prevention of any food product exceeding the limits from entering market distribution. When a food product fails the inspection, not only is the specific item in question disposed of, but all products of the same kind originating from the same area are banned from market distribution. So far there has been no case where radiation exceeding the limits is detected in any product after market distribution, and there has been no report of health damage from consumptions of food and drink. Moreover, GOJ has done and released daily monitoring of radiation levels in all prefectures in Japan. (Please see http://radioactivity.nsr.go.jp/en/index.html) It may come as a surprise that these radiation levels are, on average, even below the radiation level measured in Singapore due to the difference in geographical nature.. In addition to the daily monitoring, a lot of relevant scientific data and technical explanation are also available online from relevant GOJ agencies, including the following two sources. 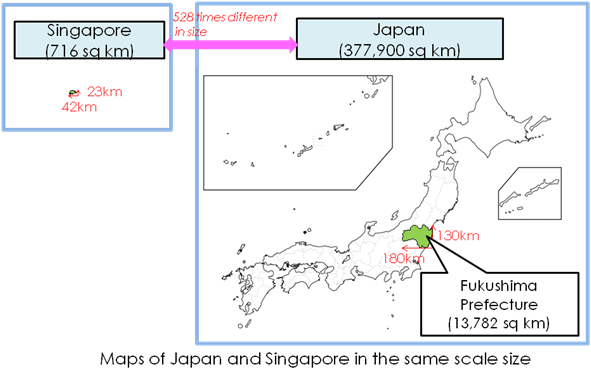 Finally, we would like to highlight to Singaporeans the point that the Fukushima Daiichi NPS is situated in a small part of Fukushima Prefecture and that Fukushima Prefecture alone is much larger than Singapore in size, as visualized below. Although Japan, compared to Singapore, is frequently hit by a variety of natural disasters including earthquakes and typhoons, their damage is usually quite limited geographically. Tokyo Electric Power Company (TEPCO) announced this June that high-level radioactive material was detected in the monitoring well-water near the Fukushima Daiichi NPS. Later, it found out that the contaminated water was leaking into the sea after monitoring at newly-drilled wells nearby. The contaminated water basically is contained within the port of the Fukushima Daiichi NPS, which is smaller than just 0.3㎢. Results of monitoring of the sea water within 20 km of the Fukushima Daiichi NPS constantly meet the safety standard both for bathing and drinking. In order to tackle the accident comprehensively, GOJ is recently determined to play a more active role. 1. Are imported Japanese food products in Singapore safe? Yes. Japanese food products being circulated in Singapore are checked by the Agri-Food & Veterinary Authority (AVA) of Singapore. AVA refers to the international standard set by Codex Alimentarius Commission (CAC), an international commission that decides on food safety standards, for the radioactive inspection on imported foods. 2. Are food products safe in Japan? Yes. Effective from April 2012, Japan has set a comprehensive safety standard for the radioactivity in food. This standard is established, on the basis of the provisional standard set after March 2011, taking into account the food intervention exemption level (exposure level that does not raise health concerns even when the food is consumed continuously) set by Codex Alimentarius Commission (CAC). The previous (provisional) standard was already much tougher than the international standards set by ICRP and WHO, but the adoption of the new legal standard will further ensure the safety of Japanese food for consumers. Needless to say, it is prohibited to circulate foods detected with radiation above the standard. The details of the current standard are available here. 3) Does the safety standard in Japan account for the safety of children? Yes. The safety standard for the radioactivity in food is set with consideration for the varied intake and susceptibility level of adults, young children and infants. For example, a stricter limit is applied to “milk” and “infant food products” consumed by children. 4) Is tap water safe in Japan? Yes. The level of radiation in the aqueduct is monitored regularly and the Ministry of Health, Labour and Welfare in Japan has verified that its radioactivity has been and is below detection limits. 5) If travellers were exposed to radiation while visiting Japan, is it possible for them to spread harmful radiation to families and friends when return? WHO says that unless a person stays in the access-restricted areas, he/she will not be exposed to harmful level of radiation. 6) What is the level of radiation in Japan now? With the exception of the access-restricted areas, there are no significant differences from the pre-accident levels and no significant differences in the average radiation level compared to the major cities in the world, including Singapore. Even in Aizuwakamatsu City of Fukushima Prefecture the figure is 0.07μSv/h which is lower than London, for example. Latest radiation readings of other international cities are available here. 7) Is it true that a person may be in danger of being exposed to radiation just by passing Fukushima in a moving vehicle? 8) Is it considered safe to enjoy hot springs in Japan now? Yes. Local government agencies and tourist boards publish the results of independent measurements of radioactivity levels in sightseeing locations with hot springs. No significant levels of radiation have been detected thus far. Some hot springs contain natural radium and other radioactive substances without any connection to the accident. Most hot springs have been utilized to promote good health since long time ago as they contain a variety of natural substances thought to be good for health. Radioactive hot springs are just one type of popular hot springs in Japan. 9) Is it considered safe to enjoy sea bathing in Japan now? Yes. Ministry of Environment publishes the results of measurements of radioactivity levels in bathing areas. No significant levels of radiation have been detected thus far. 10) Does a visit to Japan impede pregnancy or affect reproduction function? No. Risks of permanent infertility must only be considered if a person is exposed to very high levels of radiation (3,500~6,000 mSv per year for testis, versus 2,500~6,000 mSv per year for ovaries). A person is unlikely to be exposed to the radiation level exceeding 20 mSv per year even if he/she spends an entire year in Japan, unless he/she enters the access-restricted areas mentioned above. 11) If a mother was exposed to radiation, will her child develop health problems her child ? Also, when children are exposed to radiation, what possible effects are there on their reproduction function when they grow up? There has been no evidence suggesting ill effects on genes, such as those leading to birth defects, abnormal pigmentation and sudden mutation of blood protein. ABCC (The Atomic Bomb Casualty Commission) has continued research and study on the effects of radiation on heredity since 1945. 12) Are there any radioactive particles adhering to products sold at souvenir and other shops in Japan? Manufactured products originating from regions where there may be radioactive particles in the environment are voluntarily tested. No significant levels of radiation have been detected thus far.